COMMENTARY – The Runnin’ Utes had two key contests at home last week against the L.A. schools and managed a split. A sweep would have put Utah in the driver’s seat for at least a tie for second place and no less than the No. 3 seed in the Pac-12 Tournament. Even so, the sky is not falling just because they split. Utah showed a lot of heart in holding on against UCLA on Thursday (and expended a lot of energy and emotion in the process). 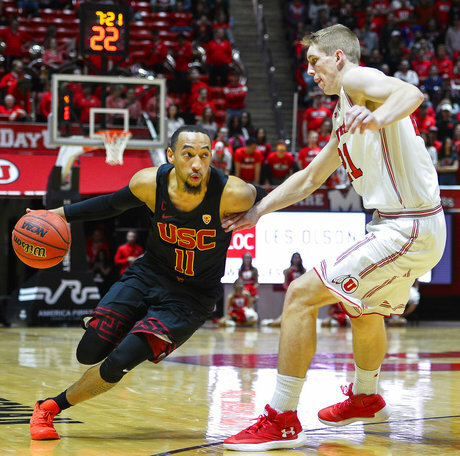 When they tipped off approximately 38 hours later against USC (which had a Wednesday game, affording the Trojans more rest while in transit from Boulder to Salt Lake City), the Runnin’ Utes simply looked tired. Shots were consistently short and they just didn’t have the same energy. The refereeing on Saturday afternoon was absolutely horrific, one of the worst displays by an officiating crew I have seen in quite some time. Nevertheless, the officials still did not cost Utah the game and the Runnin’ Utes likely would have come out on the wrong end of a well-officiated game. Currently, Utah is tied with UCLA for fourth in the conference. Only one regular season game remains — a home game against Colorado on Saturday night. Win and the Runnin’ Utes finish 11-7 in conference play; lose and they finish 10-8. Either way, they will have a winning record in conference play (something much-lauded Arizona State can only dream about). Even with Saturday’s loss, Utah is currently still the hottest team in the league having won five of the last six games. Over that same span, conference-leading Arizona is 3-3, USC is 4-2, Stanford is 4-2, UCLA is 3-3, Oregon is 4-2, Washington is 2-4, Colorado is 3-3, and national-darling Arizona State is 3-3 (having lost the last three in a row — can someone please explain to me why they still deserve to be a lock for the NCAA Tournament?). Now let’s be honest with ourselves, at the beginning of the month when the Runnin’ Utes were sitting at 5-6 in conference play, who had resigned themselves to a mediocre year and another early exit in the NIT, and who really thought that Utah would ever get any serious consideration for an invitation to the Big Dance? I am guilty of the former (and I’m betting that far more people than those willing to admit it are, too). That’s why they play the games and that’s what makes sports so fascinating — anything can happen. The upcoming Pac-12 Tournament is setting up to be an epic battle among some very evenly-matched teams, all trying to punch their ticket to the dance. But let’s not get too far ahead of ourselves. The Runnin’ Utes wrap up the regular season Saturday night with Senior Night on The Hill. Meanwhile, in the other City by the Bay, the Red Rocks had a rare loss to the Golden Bears. The meet came down to the very last routine, and when Cal’s Ton-Ann Williams scored a 9.975 on the final floor routine the Golden Bears eked out the win 197.500-197.450. Notably, MyKayla Skinner was not in the all-around lineup for the first time ever in her career at Utah. She sat out both the vault and floor as a precautionary measure after tweaking her ankle last week against UCLA. This opened the door for other gymnasts to step up and shine. 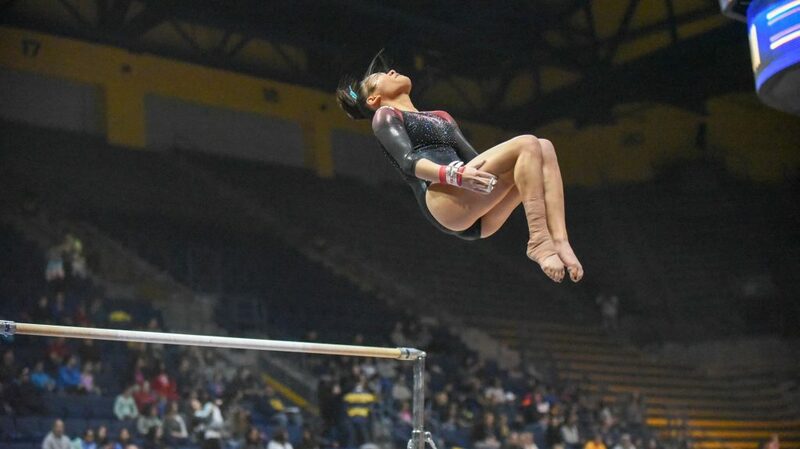 Missy Reinstadtler did just that with a career-high 39.500 in the all-around. Many Red Rocks had great individual performances, including Kari Lee, who tied for first on both vault and beam, and Kim Tessen, who also had a share in first on the vault. Tiffani Lewis continued to be a great pace-setter, leading off the vault with a season-high 9.875. This was just a single meet. An opportunity to work out the inevitable kinks. A chance for other gymnasts on the squad to compete, get some experience, grow, develop and get better. While Skinner is a key cog in the Red Rock machine, she cannot win the team title on her own and the entire squad is going to have to come together and compete at an elite level. This meet was an important step in that direction. The Red Rocks are still ranked No. 4 nationally, and are in the top-six in all four events. Utah has a bye this week and will be on the road again next week at national powerhouse Michigan. Here’s hoping the Runnin’ Utes close out strong against Colorado on Saturday and the Red Rocks take a deep breath and make the most of their bye this week.